The PR team is always looking for the newest and best visitor experiences from every corner of the state to pitch to national travel writers. No experience or destination is too small. Most times, the story behind the story is what gains earned media coverage. Below is our PR calendar and details on how you can participate. Send an email to Industry.Relations@state.nm.us with your ideas and submissions. Now, put on your thinking caps and throw us your best pitch! Angle: New Mexico is home to a plethora of epic hikes among the world’s most amazing landscapes, caves and hoodoo rock formations. Fill your thirst for authenticity exploring some of the most significant archeological ruins. Where: Chaco Canyon, Tent Rocks, etc. Angle: New Mexico’s long, warm summer days make for beautiful desert nights. Enjoy your favorite summer activities in the Land of Enchantment, with wide open spaces, deep blue skies and (surprise!) sparkling water in pristine wilderness. How to Participatet: Festivals, concerts, etc. 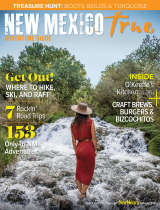 Angle: Not only is New Mexico home to some of the most well-preserved aspects of Route 66, road trips abound in the fifth largest state. Did you know the Land of Enchantment is home to the Musical Highway? How to Participate: Best small towns to take a road trip to.